My mother is an avid sci-fi/fantasy reader so I’ve been reading those genres for as long as I can remember. She and my father were also very intentional about the books I was exposed to so I always had literature that featured people whose experiences reflected my own. The confluence of her sci-fi fanaticism and their commitment to multicultural literacy have produced the Afrofuturism appreciator I am today. 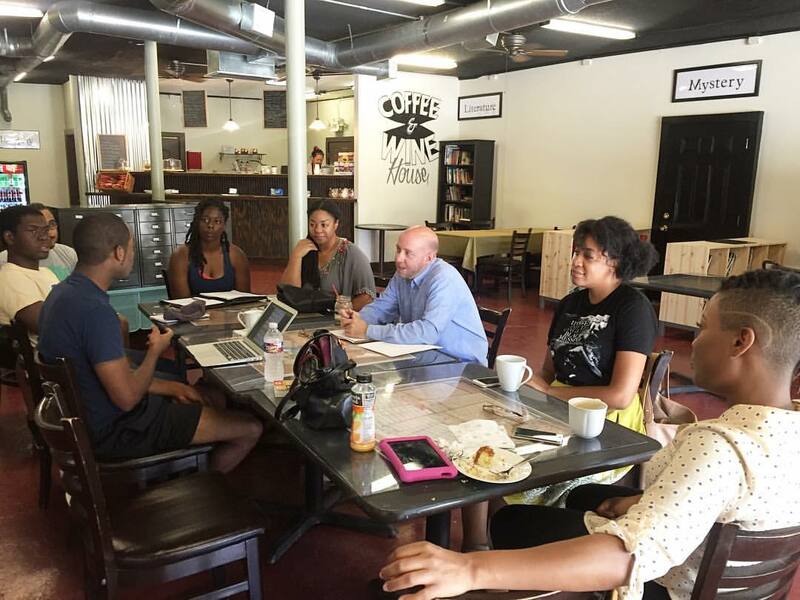 I started this book club because I keep meeting other Houstonians who share these interests and so on July 10 we came together at The Library Coffee and Wine House for our first meeting. In the club we’ll be discussing mostly short stories and I chose Bloodchild by Octavia Butler because it’s easily google-able and a delightful read. Below are some discussion points I found interesting. How is gender treated in Bloodchild? Why does Gan seem feminine to most readers? T’Gatoi contains elements of both the masculine and feminine, seen in her designation as a woman but also in the way that she penetrates in order to implant the eggs. Authority tends to be the prerogative of the females, as male Tlic and Terrans are primarily seen as useful for breeding. Regarding our protagonist Gan, when we first encounter him he’s cuddling with T’Gatoi, occupying a submissive position, and we hear that he’s too skinny. Butler also refrains from identifying the gender of Gan until later in the story which I believe was part of an intentional flouting of traditional gender norms. I find it interesting to see that women are the leaders of both species and women have taken the initiative in setting the rules of engagement between the two species. How does morality factor into this story? What about interspecies cultural norms? We know nothing of the Tlic’s morals, except for the fact that they have taken humans into their world and subsequently placed them within this oppressive system. The Tlic society is built around reproduction, and their interactions with the humans are indicative of that priority. Since humans are the best tool available to maximize safety of offspring, why are the humans allowed any independence? My thought was this is purely altruism on the part of the Tlic, but upon further discussion (and prompt dismissal from some of the others lol), we entertained the idea of Terran breeders being used as political tools within a capitalist system. For this species that views reproduction as a top priority, reproduction has become currency. The Tlic may value Terrans as sentient partners of a sort, but if Terrans are seen primarily as incubators for their children can they ever truly be equal? On the Terran’s side, how much do they owe the Tlic for this safe haven, however flawed? What should they expect to give up to their hosts as cultural gratitude after being saved from almost certain extinction? Similarly, how much independence should they be allowed after exhibiting such dangerous behavior? What does oppression look like in the story? What do we know about the ways in which Terrans resist their oppression? I’m hoping that this post gave you enough of an incentive to go read the ~20 pages of Bloodchild. If you’re interested in continuing along with us, we’re reading Butler’s The Evening and the Morning and the Night (also google-able) next and watching RAIN, a short fan film about Storm of the X-Men by Maya Glick. Let me know if you’re in Houston and want to attend our next gathering in August! Previous Post July 14 Events: Kung Fu, Startups, and Snakes on a Plane!